Stroke is the third leading cause of death in the United States of America and experimental models of stroke continue to be invaluable for studying all aspects of stroke initiation, evolution as well as investigating the efficacy of potential therapies. The brains of non-human primates (NHPs) are structurally and functionally more similar to human brain than any other animal. In addition, the NHPs, physiology is also similar to that of humans and as such, stroke models have been especially important in neuroscience research. However, NHPs are used in limited numbers due to strict animal committee regulations which only allow the use of NHPs for neuroscience research, if the knowledge gained outweighs the potential pain and suffering that the animals may undergo and the physical and psychological well being of the animals are guaranteed. Recently, not only has there been a steady increase in the use of non-invasive imaging to study the NHP brain, there has also been the development of stroke models that are created using minimally invasive surgical procedures. These models are important for the following reasons; they do not involve prolonged surgical plane anesthesia hence the amount of anesthetic stress is minimized, the post surgical recovery period is shortened and the recovery after stroke and the overall survival rate (for long term monitoring) are greatly improved. This paper reviews the use of imaging in the study of stroke in nonhuman primates. We will introduce the reader to the MCA vascular anatomy and explore various experimental models of stroke creation in non-human primates (NHPs). We will review the non-invasive imaging methodologies used in stroke research with a focus on CT, PET and MRI. Finally, we will review emerging MRI techniques that may prove invaluable for long term study of stroke in NHPs, particularly functional recovery and emerging therapies. The neurovascular anatomy in NHPs is very similar to that in humans and can be visualized by minimally invasive Digital Subtraction X-ray Angiography (DSA, Fig. 1) which shows the major cerebral arteries in one hemisphere of a macaque brain. While DSA allows exquisite visualization of the cerebral vasculature and is widely used clinically for assessing and treating acute stroke patients, in NHP models DSA has been used only to facilitate the process of stroke creation, as described below. Posterior-Anterior X-ray subtraction angiogram obtained during tracer injection via a guide catheter placed in the right CCA in a macaque. Major cerebral vessels are annotated: CCA-common carotid artery, ECA-external carotid artery, ICA-internal carotid artery (supplying the brain), MCA-middle cerebral artery, M1-branch of the MCA. White arrow at the top indicates the midline of the brain. Middle cerebral artery (MCA) occlusion models in nonhuman primates have employed a variety of surgical approaches; femoral or common carotid artery cannulation (to gain access to the MCA with endovascular catheters), direct access to the MCA via a cranial window or using a transorbital surgical route. Models which create small, selective MCA infarctions have long been reported and are highly desirable because the investigator is able to select the precise sensory/motor territory either through a small burr hole (Trypanectomy) in the skull or via the orbital socket. For example, Bornschlegl, et al. used a surgical approach which involved drilling a burr hole (in the skull) directly above the thalamus followed by lesioning of the thalamic nuclei (application of a small amount of kainic acid) to produce a range of motor deficits in the brains of macaques (M fasicularis) . A more invasive method which involves removal of a skull flap (craniotomy) has also been used in squirrel monkeys  and these methods also allow creation of small, reproducible stroke lesions at the selected site. In addition, Roitberg et al used a highly invasive surgical approach, a pterional craniectomy, to expose the M1 branch of the MCA . This model resulted in large strokes with severe neurological consequences. These surgical approaches have been coupled with various means to artificially embolize the MCA. For example, silicone spheres were delivered to the ICA via the classic intraluminal suture model route in Macacca mulatta  and autologous blood clots injected into the ICA in cynomolgus macaques . In addition, inflatable balloons have been placed around the MCA (via the transorbital MCA route in baboons)  and inflated to occlude the ICA. Clot obstruction of the MCA (the thromboembolic model) is a highly desirable method for stroke creation as it closely mimics actual clot obstruction in humans. However, the challenge with this model is creating a clot with the proper rheological properties that is not easily lysed by the body’s antithrombotic mechanisms. Successful embolization of the MCA using such clots have been demonstrated in baboons  and cynomolgus macaques [5, 7]. Mechanical blockage of the MCA is the technique used in the classic intraluminal suture model, where an intravascular catheter is advanced into the ICA and a solid filament, suture, is inserted and advanced into the ICA until there is resistance i.e., the vessel is occluded. This is a technique most frequently used in rodent stroke models, especially in MR imaging studies. 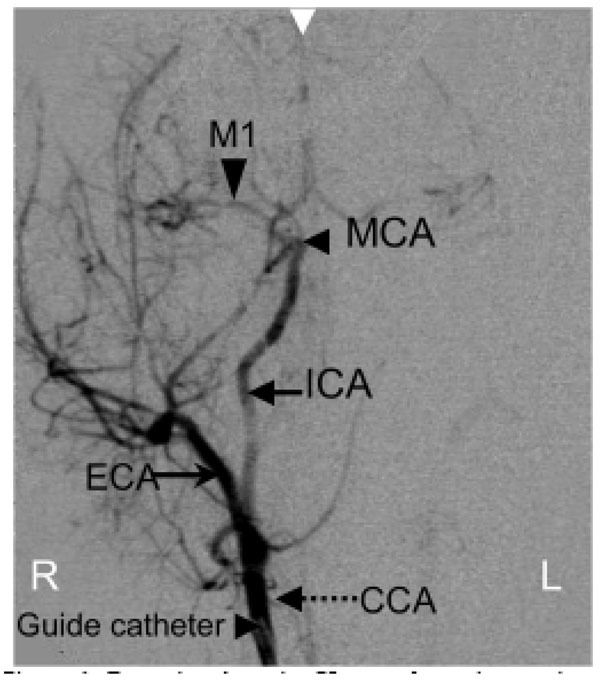 Endovascular access to the MCA vasculature involves surgical cutdown to directly visualize the CCA. In the models described hereafter, cerebral vascular access is via the femoral artery. The intraluminal suture model was adapted by Hamberg, et al. to produce MCA occlusion (MCAo) in baboons . An angiographic guide catheter was introduced into the femoral artery and navigated under X-ray fluoroscopic guidance into the MCA, followed by occlusion of the vessel with either an angiographic balloon catheter or an angiographic coil. A reperfusion model involving two cerebral vessels has been reported by Jungreis et al., . This model involves permanent embolization of one posterior communicating artery (PCA) with detachable embolization coils together with temporary (inflatable balloon) occlusion of the other PCA, reperfusion ensues after deflation of the balloon. Selectively catheterizing branches of the MCA using interventional procedures is clearly the least invasive method of stroke creation. Further modification of the baboon MCAo model was effected to create a reversible model of MCAo in cynomolgus macaques [10, 11]. An endovascular microcatheter was wedged occlusively in the M1 branch of the MCA (Fig. 2) in cynomolgus macaques for a period of up to 3 hours; the catheter was “locked” in place by fixing the proximal end within the guide catheter. Reperfusion was effected by simply withdrawing the microcatheter. This model used diffusion and perfusion MRI to study acute and chronic stroke evolution for up to 30 days  . (A) lateral angiogram of a macaque’s brain, pre-occlusion showing the arterial tree downstream of the guide catheter positioned within the CCA. (B) lateral X-ray of the head showing the microcatheter positioned in the MCA. (C) lateral angiogram, post-occlusion through the microcatheter showing the wedge shaped perfusion deficit (M1 Rolandic cortex). Adapted from . Permanent occlusion of the MCA can also be achieved, using the same approach, by injection of a bolus of cyanoacrylate adhesive into the MCA via the microcatheter . A modification of this approach, using detachable microcoils to temporarily occlude the posterior cerebral artery in Macacca nemestrina  and the anterior cerebral artery in baboons  has also been demonstrated. One key feature of any stroke model used in neuroscience research is the reproducibility of the location and extent of the ischemic lesion. Direct MCA occlusion models allow external visualization of the vascular anatomy and precise control of the segment of the vessel to be occluded and these methods produce small, highly reproducible ischemic lesions. Methods based on an intravascular approach; for example balloon inflation within the vessel, wedging an endovascular catheter in the vessel, tend to produce lesions that are somewhat more variable as these models are highly dependent on the size of the vessels (vary between animals) to be occluded as well as the skill of the person performing the vascular interventional procedures. The embolic models can be the most variable, especially using blood clots, since there is a relative lack of control during deployment of the embolus within the vessel. There is also the potential for spontaneous autolysis of the emboli. Another key variable which affects stroke lesion size is the arterial occlusion duration: a proximal M1 MCAo for 3 hours reliably results in a permanent infarct which is larger if the vessel is permanently occluded . There is also data to suggest that more distal branch occlusions may not always result in an infarct even after 6 hours of occlusion . Further discussion of the role of occlusion duration in NHP stroke models is provided by Young, et al. . While the purpose of non-invasive imaging in human stroke is purely for diagnostic/prognostic reasons, these imaging modalities are used as investigational tools in NHP studies that seek to answer specific scientific questions about stroke initiation and evolution. Several tomographic imaging modalities used to image human stroke patients have also been used to image stroke models in NHPs. Due to the widespread availability of CT scanners, a number of studies (especially the early ones) have used this modality to monitor stroke evolution. A few studies have been performed using PET, mainly to monitor cerebral perfusion and metabolic changes during stroke. More recently, an increasing number of papers have been published using MRI to monitor stroke evolution in NHPs. MRI is becoming the method of choice for such studies due to its excellent soft tissue contrast, its ability to measure a variety of different parameters relevant to cerebral ischemia and a number of recent technical advances which have improved image quality in the small primate brains. Although MRI provides superior structural and hemodynamic information regarding the status of the stroked brain, it is not the first modality of choice in an emergency room setting. In the emergency acute stroke setting, the first imaging modality used is typically non-contrast CT for detecting hemorrhage followed, in some centers, by contrast enhanced CT angiography for determining the presence and location of vascular emboli. However, in NHP studies MRI has shown its superior quality for detecting stroke and monitoring stroke evolution, from the early hyperacute stage (30 minutes after stroke onset) through the chronic period, 30 days [11, 12]. Another important consideration for imaging the brains of NHPs is the size of the animal. Due to their size, macaques and baboons have typically been studied using clinical CT, PET and MRI scanners, while a few studies on smaller primates such as squirrel monkeys and marmosets have used dedicated small animal MRI scanners. Computed Tomography (CT) scanning is routinely used in the clinical assessment of cerebral ischemia, in particular hemorrhagic stroke although it is not always reliable in determining exact infarct location during the hyperacute period (0-5 hours post occlusion) . CT scanning has also been used in neuroimaging studies of experimental stroke in nonhuman primates. Del Zoppo et al., performed serial CT scanning on baboon brains at baseline and during the acute through chronic period post MCAo . The infarcted regions were identified as hypodense regions (chronic period) and hemorrhage as regions of high density (in the acute period), compared to the surrounding tissues in the CT scans. These findings were confirmed with histopathology. In addition, Hamberg, et al. used functional (perfusion) CT to identify the initial cerebral perfusion deficits which predicted final infarct size. Positron emission tomography (PET) can employ a wide range of radiotracers to extract functional and metabolic information from living systems. In the context of stroke, the most widely used approaches involve 2-18F-fluoro-2-deoxy-D-glucose (FDG) to measure relative or absolute brain glucose metabolism (CMRglu), 15O water injection to measure regional cerebral blood flow, 15O2 gas to measure oxygen metabolism (CMRO2) and oxygen extraction ratio (OER). Dual tracer approaches (i.e. use of 2 tracers in the same imaging session) are possible due to the large difference in decay times of 15O (2 minutes) and 18F (110 minutes). The dual tracer technique is especially important in the monitoring of stroke evolution as perilesional regions that show an uncoupling of CBF and CMRglu (decreased CBF and increased CMRglu) are identifiable as potentially salvageable brain tissue, as demonstrated in studies of nonhuman primates [5, 17, 18]. In cynomolgus macaques, within approximately 90 minutes of MCAo decreased CBF and CMRO2 were observed in the subcortical MCA territories while OEF was increased in the cortex in both the transient and permanent occlusion models . Subsequently, both OEF and CMRO2 were decreased in the hyperperfused cortex heralding reperfusion injury. In direct contrast to this result, Pappata, et al. also showed that CBF was decreased after MCAo in the occluded territory (transient occlusion) of baboon brains but, the OEF was increased in this territory for up to 3 hours after occlusion. After 3 hours a decline in OEF was coincident with a decline in CMRO2. In this study, CMRO2 was found to be the best predictor of reversible or irreversible ischemia . Apart from the occlusion duration and or early reperfusion, the initial severity of the ischemic insult is also known to determine the fate of the tissue is at risk . MRI is an attractive modality for monitoring stroke in NHP both because of its ability to measure a variety of different tissue parameters as well as its fairly widespread availability to monitor human stroke (thus improving the ‘translatability’ of the imaging findings to the clinic). One challenge to working with NHPs is the need to immobilize the animal and this is generally achieved using anesthesia. This provides a special difficulty for MRI because of the limited access to the animal inside the magnet bore as well as the obvious need for non-magnetic anesthesia equipment. MRI scanning sessions also tend to be much longer than CT scans and even most PET scans. However with proper anesthesia and physiological monitoring, NHPs can be subjected to long imaging periods (up to six hours) . Another major challenge with the use of MRI, that is not an issue for PET or CT, are image artifacts in the brain that can occur due to surgery to the head. Trapped air pockets within the tissue as well as pooled blood, clots and even extensive scar tissue can locally distort the magnetic field causing signal loss and geometric distortions, especially in the rapid diffusion and perfusion imaging scans. The most common solution to this problem is the use of one of the intravascular stroke models described above (in fact the desire to use MRI has often driven the development of such models). Nevertheless, recent work has shown that more invasive surgical stroke models may still be used in combination with MRI scanning by modifying the diffusion MRI acquisition details to reduce the sensitivity to magnetic field distortions . The current state of the art non-invasive clinical imaging modality for the assessment of stroke is diffusion weighted magnetic resonance imaging (DWI). Cell membrane depolarization followed by cell swelling (cytotoxic edema) occurs within minutes of stroke onset, the hypereacute (0-4 hours post stroke) stage . Later on, approximately 8 hours post stroke induction, there is increasing accumulation of water (vasogenic edema) within the lesion followed by widespread tissue energy failure that allows characterization of the timing and severity of the ischemic injury [24, 25]. While cytotoxic edema is visible in the acute diffusion images as areas of increased signal intensity indicating reduced apparent diffusion coefficient (ADC), vasogenic edema is more easily appreciated in the T2 weighted images and, depending on severity, may be accompanied by the attendant midline shifts, brain herniation and ventricular compression . In addition to DWI, a variant of this modality, diffusion tensor imaging (DTI) more accurately measures the 3-dimentional characteristics of water diffusion in tissue. DTI also yields measures of the directional dependence, or anisotropy, of tissue water in the vicinity of axons . The DTI derived fractional anisotropy (FA) parameter is uniquely sensitive to white matter myelination and white matter damage but generally shows little change (or in some cases a slight increase ) within the stroke region during the hyperacute phase. Fig. (3) shows T2, diffusion weighted images, ADC and FA maps (6 slices) of the brain of a cynomolgus macaque that was subjected to three hours of MCA occlusion. An acute stroke lesion is apparent in all slices of the brain in the diffusion weighted images (hyperintense region) are the ADC maps (hypointense region). There are no obvious changes within the stroke region on the T2 weighted images or FA maps . (A) Coronal T2 weighted and (B) diffusion weighted images, (C) ADC maps and (D) FA maps of the macaque brain 3 hours after MCA occlusion . An acute stroke lesion is clearly seen as the bright region on the left side of the diffusion weighted images and the corresponding dark region on the ADC maps. Multiparametric MRI indices, reflecting cerebral ischemia formation, in the hyperacute through the chronic stroke period (MCA occluded either for 3 hours or permanently) demonstrated that the evolutionary course was similar to that of stroke in humans , see Fig. (4). ADC is decreased in the hyperacute period and elevated during the subacute through chronic period. T2 remains essentially unchanged in the hyperacute period but, increases dramatically during the subacute period when there is accumulation of water (vasogenic edema) in the infarcted tissue. The timecourse of changes for permanent stroke is similar but delayed compared to 3hr (MCAo) reperfused stroke. Fig. (5) shows CSF-suppressed T2 weighted (FLAIR) images of a macaque’s brain showing a large stroke that resulted in herniation and a midline shift. Gross sections of the excised brain show a hemorrhagic core within the lesion, that was also seen on the stained histology sections. Graphs of ADC (A), T2 (B) and stroke lesion lesion volume in the macaques’ brains (measured from the ADC maps in the acute stage and the T2 weighted scans in the chronic stage), all normalized to their respective baseline value after 3 hour or permanent MCA occlusion . Coronal images of the brain of a macaque that suffered a large stroke . Top: In vivo FLAIR-T2 weighted MRI at day 10 showing herniation, mass effect and midline shift. Lower left: Gross coronal sections show tissue distortion, an obvious midline shift and some minor hemorrhage in the stroke core. 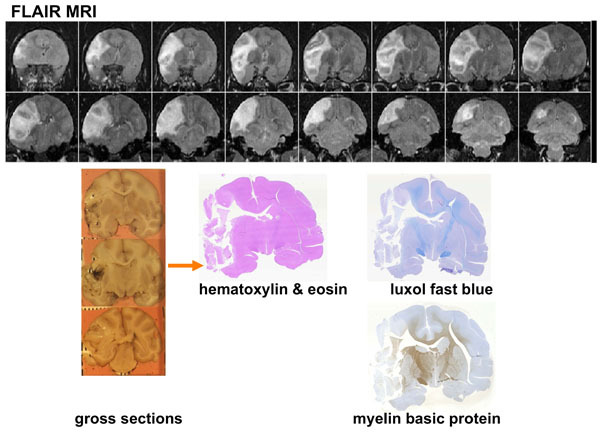 Lower right: Hematoxylin and Eosin, luxol fast blue and myelin basic stained sections show a large area of necrotic tissue. MR perfusion weighted imaging (PWI) commonly uses dynamic susceptibility weighted imaging to track an intravenous bolus injection of a Gadolinium based MR contrast agent. Mathematical modeling of these data yields relative perfusion indices such as cerebral blood flow (rCBV) and volume (rCBV), time to peak (TTP) and mean transit time (MTT) [27, 28]. During cerebral ischemia, these indices are used to identify perfusion deficits and often compared to the area of initial diffusion decrease in order to isolate potentially salvageable tissue (diffusion-perfusion mismatch). While this approach is valuable for assessing tissue at risk in acute stroke, it is not widely used in the clinics outside of a few major academic centers because of challenges with consistent data acquisition and analysis. There have been several studies involving PWI in rodent stroke models [29-31] but limited work in nonhuman primates . The need for rapid imaging generally requires a tradeoff with reduced spatial resolution and/or signal-to-noise ratio. Arterial spin labeling (ASL) is an alternative MRI perfusion technique which utilizes the subject’s blood as a contrast agent by magnetically labeling the water protons in the blood (plasma) prior to it entering the imaging region. This perfusion methodology is attractive because it requires no external contrast agent administration and renders quantitative perfusion indices . ASL acquisition may be performed with either a continuous arterial spin labeling or a pulsed arterial labeling scheme. Each scheme has its particular advantages and disadvantages and several radiofrequency pulse schemes have been devised to optimize image signal to noise (SNR) ratios . The relatively low signal-to-noise (SNR) ratio inherent in this technique can also be overcome by using a dedicated radiofrequency coil to perform the magnetic labeling of the flowing blood with a separate local receive coil to optimize image SNR and spatial resolution. The benefits and the drawbacks of a three coil system have been demonstrated in a study of rhesus macaques by Zhang, et al. who performed combined quantitative CBF and BOLD measurements under hypercapnic and hyperoxic conditions. In addition, another group of researchers (also using ASL) measured increased CBV during visual stimulation and globally increased CBV after intravenous Acetazolomide injection in cerebral gray matter in macaques . ASL has also been used to monitor the CBF-diffusion mismatch during MCAo in rhesus macaques . 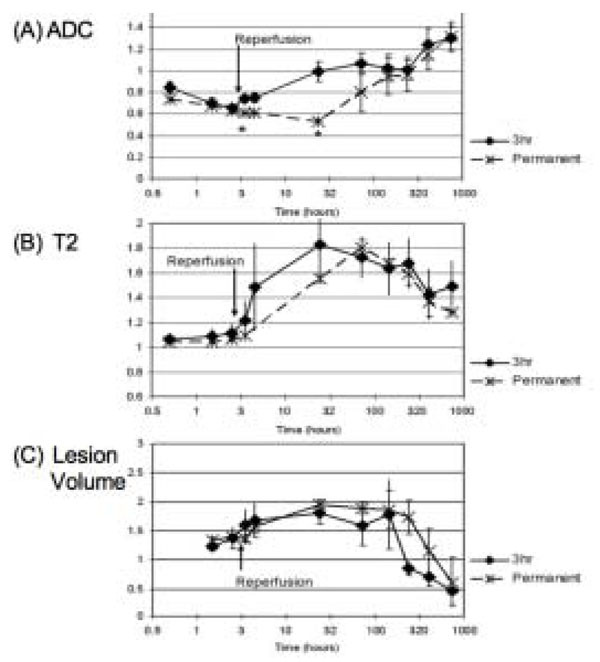 It was reported that the CBF lesion volume remained constant over six hours while the ADC lesion volume steadily increased to equal that of the CBF lesion volume. This finding reiterates what has been demonstrated in many rodent and human studies, that there is potentially salvageable tissue around the periphery of the lesion core that could be saved by reperfusion or by treatment with novel neuroprotective compounds. So far, our discussion has touched on the many MRI parameters that can be measured during stroke evolution and the different information that each provides. Typically each type of scan is analyzed separately. Approaches have been introduced to combine multiple types of MRI scans (DWI, PWI, T2-weighted) to classify tissue types (e.g. core, periphery, normal brain) and predict the ultimate tissue fate (e.g. infarct, recovery). A common approach uses an iterative self-organizing data analysis (ISODATA) technique [30, 38-40]. The ISODATA method was used to analyze multiparametric MCAo data (on a voxel by voxel basis) from cynomolgus macaques ; ADC, fractional anisotropy and T2 maps were combined and cluster analysis showed different signatures for lesion core and rim as well as between transiently and permanently occluded brains, Fig. (6). Example of cluster analysis of serial T2 and DTI scans after transient (3 hrs) MCAo in macaque brain . ADC (A) and FA (B) maps at 30 minutes after occlusion showing the hyperacute ADC reduction in the initial ischemic lesion. T2-FLAIR image (C) at 30 days, showing the final extent of the stroke lesion in this slice. Cluster map (D) based on serial changes in these parameters identifies normal brain (blue) lesion core (purple) and rim (yellow/orange). Several investigators have studied functional MRI Blood Oxygenation Level Dependent (BOLD) contrast in order to map neurovascular activity in nonhuman primates. Anderson et. have developed a robust fMRI protocol in rhesus macaques to study pharmacologically evoked responses in relatively large groups of animals and compared the results within and across groups . CBV (during visual stimulation) was measured in awake, behaving macaques using an iron contrast agent (MION) and this study showed that there was enhanced detection of functional changes in CBV with MION in the blood pool compared to the innate blood oxygen dependent ( BOLD) changes, due to the slower response in BOLD-CBV [43, 44]. A similar study (also in awake behaving macaques) was carried out at 7.0 Tesla, which capitalized on the increased signal to noise benefit of the high field scanner, to acquire functional CBV and BOLD scans at high resolution (500 μm inplane resolution) . CBF in cortical gray matter was shown to increase to approximately 1.5 times baseline during stimulation. A key advantage of nonhuman primate fMRI studies is the ability to train animals to tolerate MRI scanning without the confounds of anesthetic restraint . This is particularly challenging to translate to the study of acute stroke since anesthesia is typically required for stroke induction. Looking ahead, animals will have to be trained to tolerate MRI scanning prior to implantation of an indwelling catheter for thrombus deployment. Implantation of an indwelling catheter and stroke creation in awake baboons has been demonstrated by Spetzler et al, . After recovery from surgery, the animals will then need re-habituation for MRI before stroke creation within the MRI can be effected. Nevertheless, there is currently a technique that can assess the functional status of the brain post stroke in anesthetized animal. ‘Resting State’-BOLD fMRI signals have been recorded during hyperacute focal cerebral ischemia in anesthetized macaques and it was reported that the region of abnormal signal fluctuations extended beyond the boundaries of the ischemic ADC-CBV regions  possibly representing hyperexcitability in dysfunctional tissue (resolves in time) which is known to develop both surrounding and remote to the stroke lesion . Endothelial cell injury and loss of blood brain barrier integrity following stroke results in the accumulation of water and solutes in the extracellular space due to changes in cell membrane permeability, allowing a shift in the extracellular/intracellular sodium concentration gradient. The progressive influx of extracellular sodium after stroke in NHPs has been measured using sodium MRI and this may allow calculation of the length of time post-occlusion that the tissue has been ischemic and/or the severity of the ischemic episode [13, 50]. In studies by Thulborn et al tissue regions with sodium concentrations greater than 70 mmol/L were found to be infarcted at histology . It has also been reported that the linear increase in intracellular sodium concentration is halted by reperfusion . Sodium MRI may prove complementary to techniques such as diffusion and perfusion MRI which are very early indicators of cerebral ischemia. Proton magnetic resonance spectroscopy (H1 MRS) gives biochemical information about tissue metabolites such as choline (Cho), creatine (Cr) and N acetyl aspartate (NAA). Changes in these metabolite concentrations (e.g. with disease) are generally expressed as changes in the ratios of one metabolite signals with respect to another, since the measurement of absolute concentrations is challenging. In human stroke it has been reported (H1 MRS) that there are reduced Cho/Cr and increased NAA/Cho ratios in the perilesional tissue in the acute stroke period . In primates, regionally, significantly decreased NAA/Creatine in a penumbral region (within the thalamus) was coincident with histopathology and optically measured neuronal density findings . The authors suggested that H1 MRS can be used as a marker for neuronal loss in vivo. We have surveyed the literature on tomographic imaging in nonhuman primate stroke models. While some work has been done using CT, this modality is more limited in is ability to fully characterize ischemic tissue compared to PET and MRI. While brain perfusion can be measured by CT, more robust data can usually be obtained using PET or MRI. A few studies have used PET to image acute and chronic metabolic disturbances following experimental stroke, however as for its use in the clinic, these studies can be more challenging (and expensive) to perform compared to the use of MRI. While PET can be a useful tool to measure oxidative metabolism following stroke, and has been used in several NHP studies described above, such studies are challenging due to the need for a cyclotron to produce the short lived 15O isotope as well as (usually) the need for serial arterial blood sampling and the relatively high cost. As a tool for mapping metabolic disturbances following stroke in NHP, MRI approaches are likely more convenient for most studies. The real advantage of PET for NHP stroke studies may lie in the application of some of the wide range of highly specific 11C and 19F PET tracers, which have been used to map a variety of brain processes in both human and nonhuman primates in the fields of psychiatry and neurodegeneration. The bulk of the more recent imaging literature on NHP stroke has made use of various magnetic resonance based approaches including conventional T2-wt MRI as well as diffusion, perfusion and sodium MRI, functional MRI and magnetic resonance spectroscopy. There seems little doubt that MRI is currently the method of choice for such studies, as indeed it is for clinical stroke. Clinical MRI technology continues to evolve, with higher field systems and multi-coil receiver technology, both providing better quality images of the smaller nonhuman primate brain. The high quality fMRI scans now obtainable from awake behaving primates may allow investigators to minimize the need for potentially confounding anesthesia in primate stroke studies. This would also open the door for the use of fMRI as a adjunct or replacement for neurological assessment following stroke. Such imaging advances may help to further increase the value of NHPs in stroke research. Bornschlegl M, Asanuma H. Importance of the projection from the sensory to the motor cortex for recovery of motor function following partial thalamic lesion in the monkey Brain Res 1987; 437(1): 121-30. Nudo RJ, Larson D, Plautz EJ, Friel KM, Barbay S, Frost SB. A squirrel monkey model of poststroke motor recovery Ilar J 2003; 44(2): 161-74. Roitberg B, Khan N, Tuccar E, et al. Chronic ischemic stroke model in cynomolgus monkeys: behavioral, neuroimaging and anatomical study Neurol Res 2003; 25(1): 68-78. Bremer AM, Watanabe O, Bourke RS. Artificial embolization of the middle cerebral artery in primates. Description of an experimental model with extracranial technique Stroke 1975; 6(4): 387-90. Kuge Y, Yokota C, Tagaya M, et al. Serial changes in cerebral blood flow and flow-metabolism uncoupling in primates with acute thromboembolic stroke J Cereb Blood Flow Metab 2001; 21(3): 202-10. Del Zoppo GJ, Copeland BR, Harker LA, et al. Experimental acute thrombotic stroke in baboons Stroke 1986; 17(6): 1254-65. Kito G, Nishimura A, Susumu T, et al. Experimental thromboembolic stroke in cynomolgus monkey J Neurosci Methods 2001; 105(1): 45-53. Hamberg LM, Hunter GJ, Maynard KI, et al. Functional CT perfusion imaging in predicting the extent of cerebral infarction from a 3-hour middle cerebral arterial occlusion in a primate stroke model Ajnr 2002; 23(6): 1013-21. Jungreis CA, Nemoto E, Boada F, Horowitz MB. Model of reversible cerebral ischemia in a monkey model Ajnr 2003; 24(9): 1834-6.
 de Crespigny AJ, D'Arceuil HE, Maynard KI, et al. Acute studies of a new primate model of reversible middle cerebral artery occlusion J Stroke Cerebrovasc Dis 2005; 14(2): 80-7. LaVerde GC, Jungreis CA, Nemoto E, Boada FE. Sodium time course using 23Na MRI in reversible focal brain ischemia in the monkey J Magn Reson Imaging 2009; 30(1): 219-3. Schwartz AE, Pile-Spellman J. New model of reperfused stroke by occlusion of the anterior cerebral artery in baboons Acta neurochirurgica 2010. Young AR, Touzani O, Derlon JM, Sette G, MacKenzie ET, Baron JC. Early reperfusion in the anesthetized baboon reduces brain damage following middle cerebral artery occlusion: a quantitative analysis of infarction volume Stroke 1997; 28(3): 632-7. Horowitz SH, Zito J, Donnarumma R, Patel M, Alvir J. Computed tomographic-angiographic findings within the first five hours of cerebral infarction Stroke 1991; 22(10): 1245-53. Frykholm P, Andersson JL, Valtysson J, et al. A metabolic threshold of irreversible ischemia demonstrated by PET in a middle cerebral artery occlusion-reperfusion primate model Acta Neurol Scand 2000; 102(1): 18-26. Touzani O, Young AR, Derlon JM, et al. Sequential studies of severely hypometabolic tissue volumes after permanent middle cerebral artery occlusion. A positron emission tomographic investigation in anesthetized baboons Stroke 1995; 26(11): 2112-9. Takamatsu H, Tsukada H, Kakiuchi T, Nishiyama S, Noda A, Umemura K. Detection of reperfusion injury using PET in a monkey model of cerebral ischemia J Nucl Med 2000; 41(8): 1409-6. Pappata S, Fiorelli M, Rommel T, et al. PET study of changes in local brain hemodynamics and oxygen metabolism after unilateral middle cerebral artery occlusion in baboons J Cereb Blood Flow Metab 1993; 13(3): 416-24. Giffard C, Young AR, Kerrouche N, Derlon JM, Baron JC. Outcome of acutely ischemic brain tissue in prolonged middle cerebral artery occlusion: a serial positron emission tomography investigation in the baboon J Cereb Blood Flow Metab 2004; 24(5): 495-508. West GA, Golshani KJ, Doyle KP, et al. A new model of cortical stroke in the rhesus macaque J Cereb Blood Flow Metab 2009; 29(6): 1175-86. Moseley ME, Cohen Y, Mintorovitch J, et al. Early detection of regional cerebral ischemia in cats: comparison of diffusion- and T2-weighted MRI and spectroscopy Magn Reson Med 1990; 14(2): 330-46. Schwamm LH, Koroshetz WJ, Sorensen AG, et al. Time course of lesion development in patients with acute stroke: serial diffusion- and hemodynamic-weighted magnetic resonance imaging Stroke; a journal of cerebral circulation 1998; 29(11): 2268-76. Warach S, Li W, Ronthal M, Edelman RR. Acute cerebral ischemia: evaluation with dynamic contrast-enhanced MR imaging and MR angiography Radiology 1992; 182(1): 41-7. Weisskoff R, Kiihne S, Cohen M, Thulborn K. Quantitative in vivo blood oxygenation measurements by echo planar imaging at 1.5 Tesla Tenth Annual Meeting of the Society of Magnetic Resonance in Medicine 1991 San Francisco CA USA: SMRM 1991; 307. Shen Q, Meng X, Fisher M, Sotak CH, Duong TQ. Pixel-by-pixel spatiotemporal progression of focal ischemia derived using quantitative perfusion and diffusion imaging J Cereb Blood Flow Metab 2003; 23(12): 1479-88. Shen Q, Ren H, Fisher M, Bouley J, Duong TQ. Dynamic tracking of acute ischemic tissue fates using improved un-supervised ISO-DATA analysis of high-resolution quantitative perfusion and diffusion data J Cereb Blood Flow Metab 2004; 24(8): 887-97. Bardutzky J, Shen Q, Bouley J, Sotak CH, Duong TQ, Fisher M. Perfusion and diffusion imaging in acute focal cerebral ischemia: temporal vs. spatial resolution Brain Res 2005; 1043(1-2): 155-62. Liu Y, D'Arceuil H, He J, et al. Dynamic susceptibility contrast perfusion imaging of cerebral ischemia in nonhuman primates: comparison of Gd-DTPA and NMS60 J Magn Reson Imaging 2005; 22(4): 461-6. Detre JA, Alsop DC. Perfusion magnetic resonance imaging with continuous arterial spin labeling: methods and clinical applications in the central nervous system Eur J Radiol 1999; 30(2): 115-24. Petersen ET, Zimine I, Ho YC, Golay X. Non-invasive measurement of perfusion: a critical review of arterial spin labelling techniques Br J Radiol 2006; 79(944): 688-701. Zhang X, Nagaoka T, Auerbach EJ, et al. Quantitative basal CBF and CBF fMRI of rhesus monkeys using three-coil continuous arterial spin labeling Neuroimage 2007; 34(3): 1074-83. Zappe AC, Pfeuffer J, Merkle H, Logothetis NK, Goense JB. The effect of labeling parameters on perfusion-based fMRI in nonhuman primates J Cereb Blood Flow Metab 2008; 28(3): 640-52. Duong TQ. 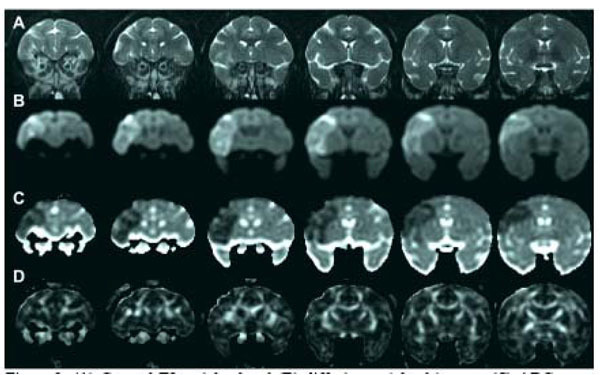 Diffusion tensor and perfusion MRI of non-human primates Methods San Diego, Calif 2010; 50(3): 125-35. Nagesh V, Welch KM, Windham JP, et al. Time course of ADCw changes in ischemic stroke: beyond the human eye! Stroke 1998; 29(9): 1778-82. Jacobs MA, Mitsias P, Soltanian-Zadeh H, et al. Multiparametric MRI tissue characterization in clinical stroke with correlation to clinical outcome: part 2 Stroke 2001; 32(4): 950-7. Jacobs MA, Zhang ZG, Knight RA, et al. A model for multi-parametric mri tissue characterization in experimental cerebral ischemia with histological validation in rat: part 1 Stroke 2000; 32(4): 943-. Bouts M, Wu O, Dijkhuizen R, de Crespigny A, D'Arceuil H. Temporal Tissue Assessment in Non-human Primate Cerebral Ischemia using Diffusion-weighted MR Imaging and ISODATA Cluster Analysis In: International Society of Magnetic Resonance in Medicine 17th Annual Meeting . Hawaii: April Honolulu 2009; pp. 18-24. Andersen AH, Zhang Z, Barber T, et al. Functional MRI studies in awake rhesus monkeys: methodological and analytical strategies J Neurosci Methods 2002; 118(2): 141-52. Dubowitz DJ, Bernheim KA, Chen DY, Bradley Jr WG, Andersen RA. Enhancing fMRI contrast in awake-behaving primates using intravascular magnetite dextran nanopartieles Neuroreport 2001; 12(11): 2335-40. Leite FP, Tsao D, Vanduffel W, et al. Repeated fMRI using iron oxide contrast agent in awake, behaving macaques at 3 Tesla Neuroimage 2002; 16(2): 283-94. Pfeuffer J, Merkle H, Beyerlein M, Steudel T, Logothetis NK. Anatomical and functional MR imaging in the macaque monkey using a vertical large-bore 7 Tesla setup Magn Reson Imaging 2004; 22(10): 1343-59. Vanduffel W, Tootell RB, Schoups AA, Orban GA. The organization of orientation selectivity throughout macaque visual cortex Cereb Cortex 2002; 12(6): 647-2. Spetzler RF, Selman WR, Weinstein P, et al. Chronic reversible cerebral ischemia: evaluation of a new baboon model Neurosurgery 1980; 7(3): 257-61. Liu Y, D'Arceuil H, He J, et al. MRI of spontaneous fluctuations after acute cerebral ischemia in nonhuman primates J Magn Reson Imaging 2007; 26(4): 1112-6. Thulborn KR, Gindin TS, Davis D, Erb P. Comprehensive MR imaging protocol for stroke management: tissue sodium concentration as a measure of tissue viability in nonhuman primate studies and in clinical studies Radiology 1999; 213(1): 156-66. Kim GE, Lee JH, Cho YP, Kim ST. Metabolic changes in the ischemic penumbra after carotid endarterectomy in stroke patients by localized in vivo proton magnetic resonance spectroscopy (1H-MRS) Cardiovasc Surg 200; 9(4): 55.